This postcard shows the ticket booth of Grimsby Park. This booth was located at the south end of Grand Ave, close to the Grand Trunk Railroad station. 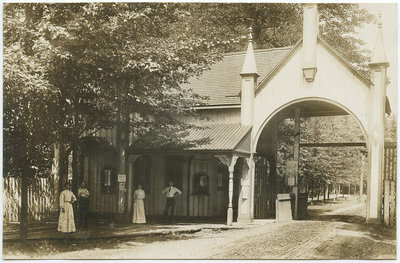 The trees which lined Grand Avenue are clearly visible in the background.Two women and two men are standing in from of the ticket booth and a man is visible in the ticket window.